I firmly believe that you can transform any dish into a sandwich. To exemplify that, just check out fellow Chicagoland native and Food Network Star, Jeff Mauro - The Sandwich King! Inspired by his creativity and how much we enjoyed the hot ham and cheese sliders, why not turn a pizza into a slider sandwich? I basically made pizza ingredient substitutions to make this and you can adapt this however you'd like. Do you like peppers and mushrooms on your pizza? If so, saute them and add it in the slider! Do you prefer a white alfredo sauce over the traditional red sauce? If so, use that instead! In the end, it'll be delicious and easy... and if you're looking to get your kids in the kitchen, this recipe is great. Joel really enjoyed making this with me! 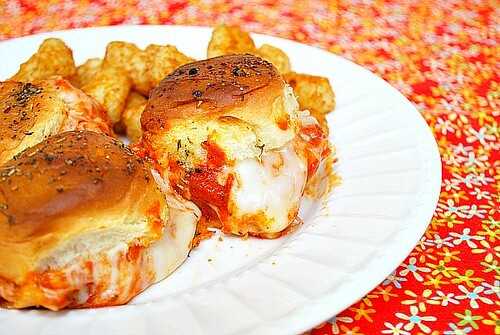 Spread pizza sauce onto both sides of the center of each roll. 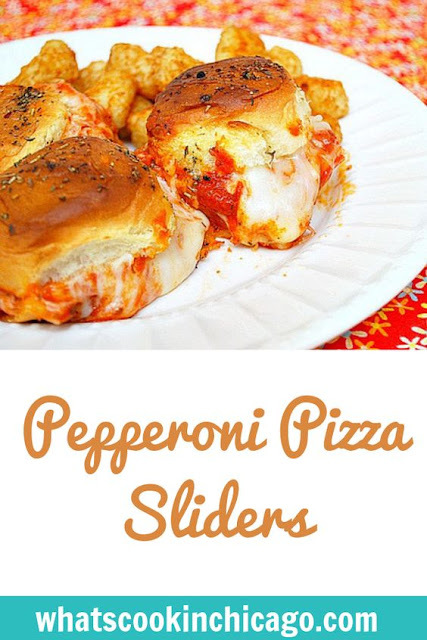 Place a large slice (or a few small slices) of pepperoni and a some shredded cheese inside of each roll. Close rolls and place them close together into a large baking dish or heavy cookie sheet. In a small bowl, whisk together all of the sauce ingredients. Pour evenly over all of the sandwiches, just enough to cover the tops; let sandwiches sit for 10 minutes to absorb the butter and seasonings. At this point, sandwiches can be assembled a day ahead, covered and kept in the fridge ready to bake. Oh these look awesome! Pizza in sandwich form is okay by me. Holy cow, Joelen, these look great! Can't wait to try the recipe! This seems like a really great alternative to pizza night. Must be very delicious. This is my favourite food.